Hungary’s neo-Nazi party, Jobbik, has recently launched a campaign in North America. They are recruiting willing and able organizers to spread the far-right ideology in the United States. Gábor Vona, Chairman of the extremist party, has officially installed Mr. László Baumeister (also known Laszlo Wilhelm Baumeiszter) as Jobbik’s party organizer in New York. Mr. Baumeister is 54 years old and lives in Merrick, Nassau County, NY. 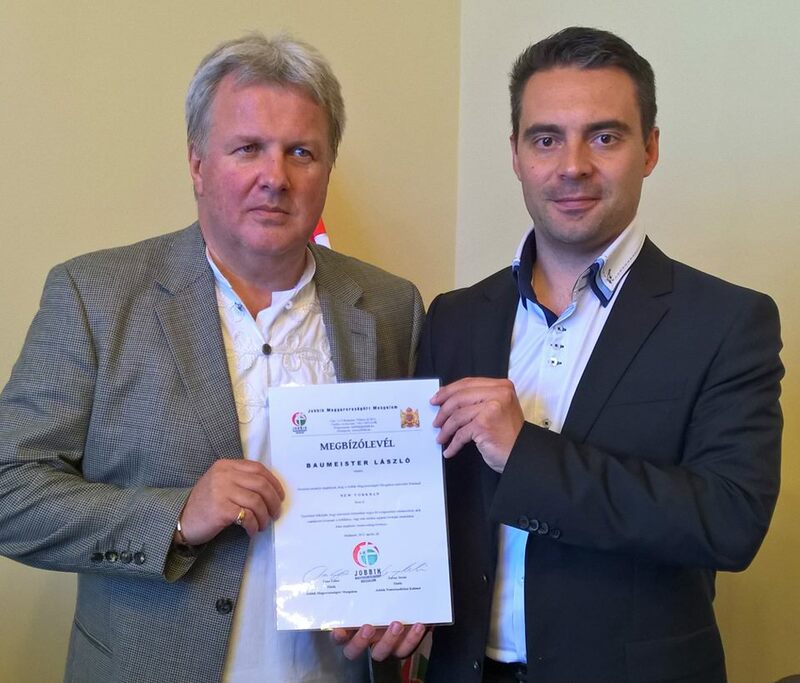 Mr. Baumeister (left) receives his accreditation from Jobbik Party Chairman Mr. Vona. 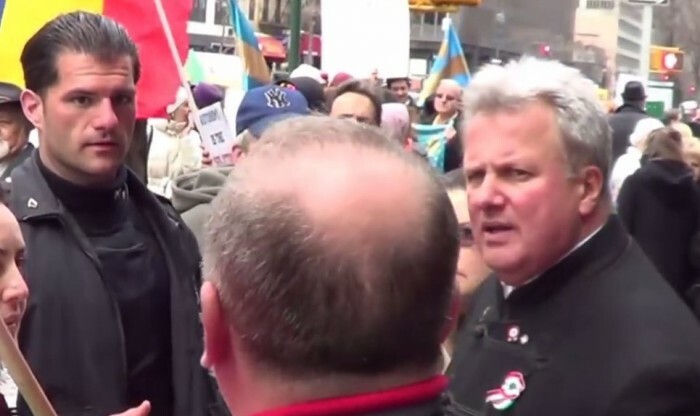 In 2013, he was one of the organizers of the Jobbik demonstration for Sekler Autonomy in front of the Romanian Consulate in New York City. As party chairman, Mr. Vona has visited the US in 2010, and at that time no Hungarian official would talk to him. Mr. László Böjtös, Honorary Consul in Cleveland refused any association with Jobbik, and Mr. Károly Dán, Consul General in New York City also refused to receive the Jobbik politician at the Consulate. Mr. Baumeister (right) negotiates with a Police Officer(left) during the 2013 Sekler Autonomy demonstration in New York City. Things have changed. A couple of weeks ago, the Hungarian Consulate in New York led by Mr. Ferenc Kumin welcomed the visit of a Jobbik delegation and Hungary’s Ambassador Ms. Réka Szemerkényi also met them at the Embassy in Washington DC. Ms. Szemerkényi has indicated to the Hungarian Free Press that “it would be legally unacceptable” for her not to receive the neo-Nazi delegation. What’s the master plan? Who’s pulling the strings? New guys on the payroll? Who’s the sponsor? Yet, they are singing the old song rearranged for a new orchestra. Only the sponsor has changed or is there more? Doesn’t matter, just a few years to come and a good half of Hungarians will leave the country. Or even more of them if the Jobbik manages to grab the power. Unless Orban and the Jobbik can manage to close the doors by creating an all European stir with their hostile immigration policy, playing with quotas, that might result in a reaction favorable for them — the banning of Hungarian immigrants from entering in the EU countries. That’s the name of the game. That’s why Orban does it, the only tool to keep the Hungarians in their country. Jobbik, — another slave keeper after Fidesz and Orban. The period of tiring and exhausting the Hungarians came to an end Jobbik feels it’s time for them to harvest. So, they go that way in the footstep of Orban go to New York while Orban’s good old Finkelstein daddy is teaming up with Habony. New participants in the game? Who else? Richard, You are right on! Many Hungarians who denied their memberships in extremists organisations (thus gaining entrance into the US illegally) are now coming out and supporting the neo-Nazis and their allies the Fidesz. In Canada and the US there are as many Hungarians as in Erdely thus their votes can bring victory in 2018 for Jobbik. 1. The Fidesz has been making a terrible mistake when focusing only the quantity and not the quality of his supporters. As a consequence of this materialistic politics, they practically lost the moral and intellectual support of the conservative and patriotic-liberal intellectuals as well as that of the majority of the young people, who would be for the Hungary f Citizens (Polgári Magyarország), but who could not believe that a country of suspiciously extremely well-of, half-educated chief-adviser or and ministers of unambiguously gangster-looking phenotype, – (that is: a “Habonyország”) – would be equivalent to Hungary of Citizens (Polgári Magyarország). Considering that the so-called Hungarian left could not offer any alternatives, we, intellectuals and West-oriented youth became passive. At the same time the uneducated mob (“thanks” for ghe bad decision for reducing the education time from the age of 18 to 16) is open for the Jobbik radicalism. They do not understand that the way of Jobbik is a trap of Putyin. Nobody explains them what does it mean that Russia, throughout her history, has always been the prison of nations. Considering that Fidesz do (or could?) 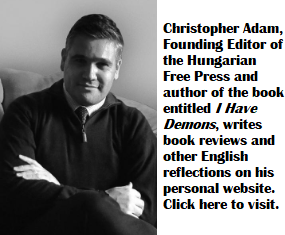 not) change its attitude towards his natural political background andprevius supporters, it became the prisoner of the situation and running toward the suicide politics of Fidesz-Jobbik coalition. I am sure that Orbán, – who is a patriot and not a Putyin-puppet – probably tries to resist, but he is unambiguously unable, because he seems to be run out of new ideas and conceptions, while those who are around him influence him negatively, or maybe blackmail him with something, what we could not see from outside. These description is especially true concerning Szijjártó and Habony, the enemy number 1 and 2 of the West-Oriented Free Hungary and maybe are the Pocket-Babies of Kanga-Putyin. We Hungarian patriotic intellectuals are extremely pessimistic about the advancs of the Jobbik and about the total impotence of the Fidesz. But – thanks, – we do not need any help from the homeland-traitor Hungarophobic neo-bolsheviks. We hope and wait for the reborn of a real pro-Western political opposition of the spirit of 1956 and 1848, which has no tie neither to the ex-communist nor to the extreme right. 2. The 2nd and the 3rd Fidesz government is unable to send a a respected, educated person of great western respect as an Ambassador of Hungary to Washington. Neither the present o the previous Ambassador could not be taken seriously in Washington. And – none of the two have been taken seriously. This is a consequence of the (non-explainable) inferiority feeling of our Prime Minister toward educated, intelligent persons, professors, diplomats and other “trouser-bearing” people. He seems to feel comfortable in the company of “friends(? )” from less-educated circles. What if I told you: nationalist =/= neo-nazi.